A fast moving blaze struck Rialto area of San Bernardino county. Residents panicked and attempted self evacuation. The blaze dubbed as Sierra fire. Flames grew within minutes from 3 acres to 20 acres rapidly. Strong winds blew the fire close to homes. Bulldozers and Fire fighters rushed to evacuate and control the blaze. Power lines caught fire and lights were out in some areas. Traffic built up as residents were seen fleeing homes. 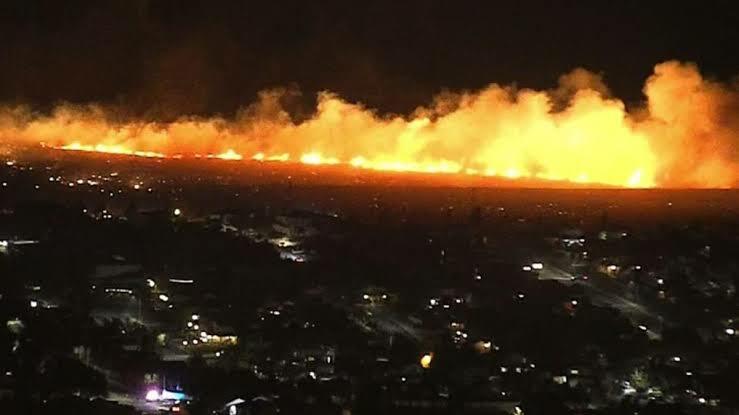 As per official figures 26 fire tenders, 3 bulldozers and a helicopter were assigned task to put down the flames. Police officers are making announcement in loud speakers. There is no plan to conduct evacuation, but people have left the area on their own. Police urged residents to keep documents and luggage ready in case of sudden evacuation plans at moments notice.